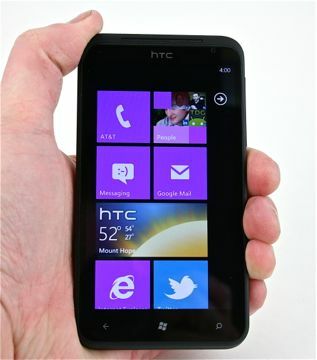 The HTC Titan is the king of the Windows Phone 7 Mango hill at the moment. It offers an excellent array of features, all-around good performance, and a few items that set it ahead of the pack. For example, the industry-leading 4.7-inch display is second-to-none in terms of size, and the performance is on par with the Super AMOLED displays from Samsung. The industrial design is appealing, and despite the device's size, it still feels good to use. The wireless performance across several networks was good, and phone calls sounded good. Perhaps the biggest chink in the Titan's armor is battery life, which I found to be lacking. On the communications and media side of things, the Titan offers all the tools that are on other smartphones: email, social networking, messaging, and contacts/calendar support. Its media prowess — thanks in part to App Connect — is excellent and visually appealing. The camera and video camera perform extremely well, and the results are sure to please most users. The HTC Titan is a terrific phone in almost all respects. Looking to out-power your smartphone-using friends? The Titan is the totally tubular tech gadget to tout over your friends' tiny telephones.